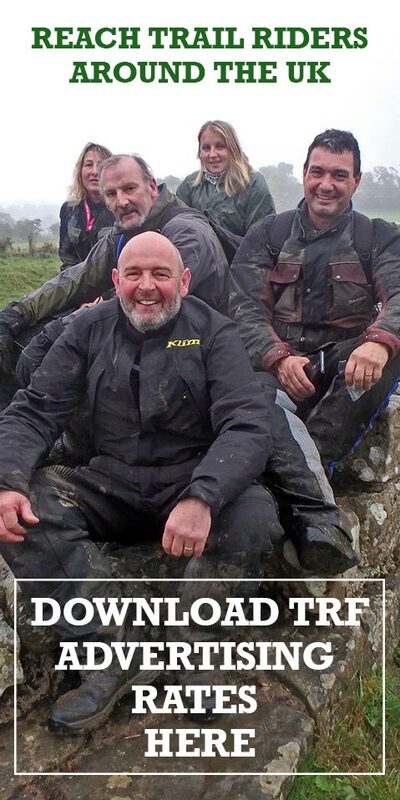 It's a brave man who declares that he has the perfect adventure bike. It's an ongoing discussion that pretty much keeps the adventure bike industry in motion. 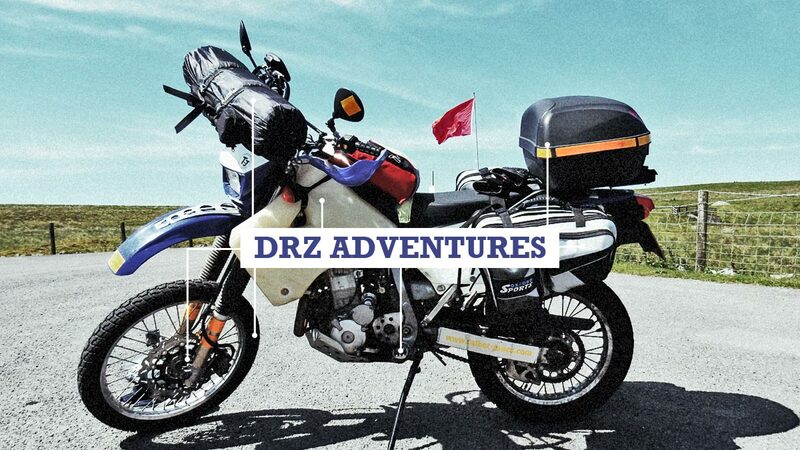 TRF member Ian Talbot Jones reckons the DRZ 400 is up to the job... with a few modifications. 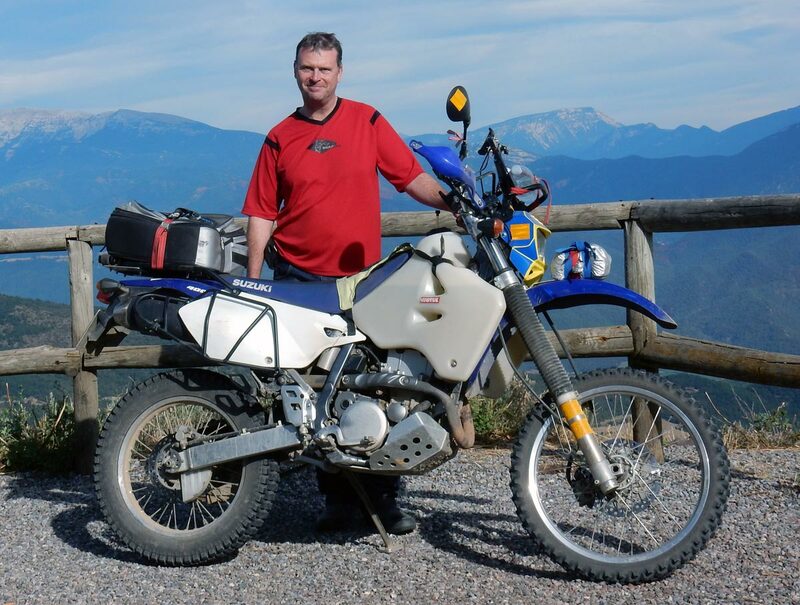 Here he shares his approach to getting the Suzuki ready for the dirt of the Pyrenees. I was riding the mountain curves and bends of the bike’s favorite N260 road in the Spanish Pyrenees. I’d read the comments on forums this was one of Europe’s best biking roads, running east to west parallel to the French Spanish border. It’s a good road, in fact a very good road however I wanted more…. My eyes were being drawn to the little dirt tracks spreading out from the main metalled trunk of the road like small branches, heading into the sun and the freedom of the unfenced wilderness. As I rode in the Spanish heat, my curiosity grew, what was down these trails? How far did they stretch? Were they open access or do you have to ride them as a covert mission avoiding detection? After 25 + years of riding road bikes, the dirt was calling and as I rode home through France the voices in my helmet were getting louder. Upon my return home I decided a new motorbike was needed and who doesn’t like dreaming of a new motorbike, comparing the specifications and kicking some wheels? 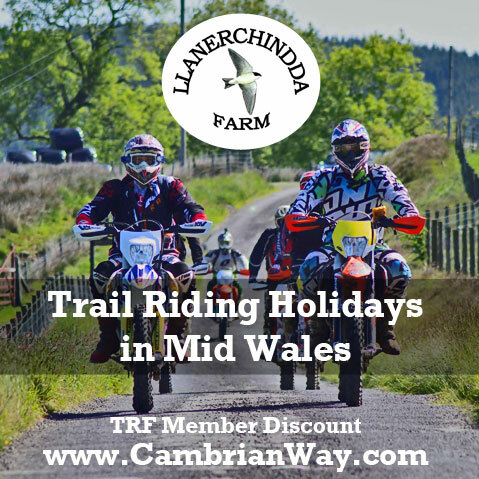 Remembering the Trail Rider’s Fellowship, I consulted their website. I found some advice on bike selection and learnt that a 250cc to 400cc bike was advised. 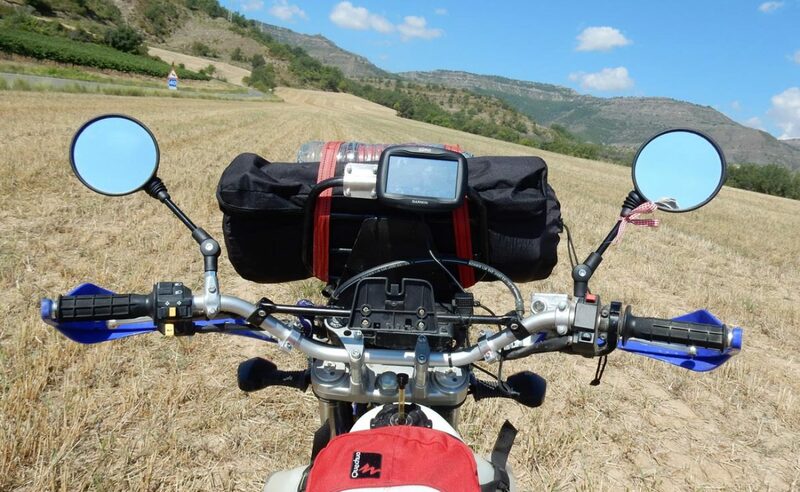 I however, had another factor to consider in my bike selection algorithm, I wanted to ride the Pyrenees dirt trails I’d seen from the previous summer, but also ride the road from the UK, through France down to Spain and back, some two thousand road miles. I needed what the Americans call a “Dual-Sport” motorcycle. 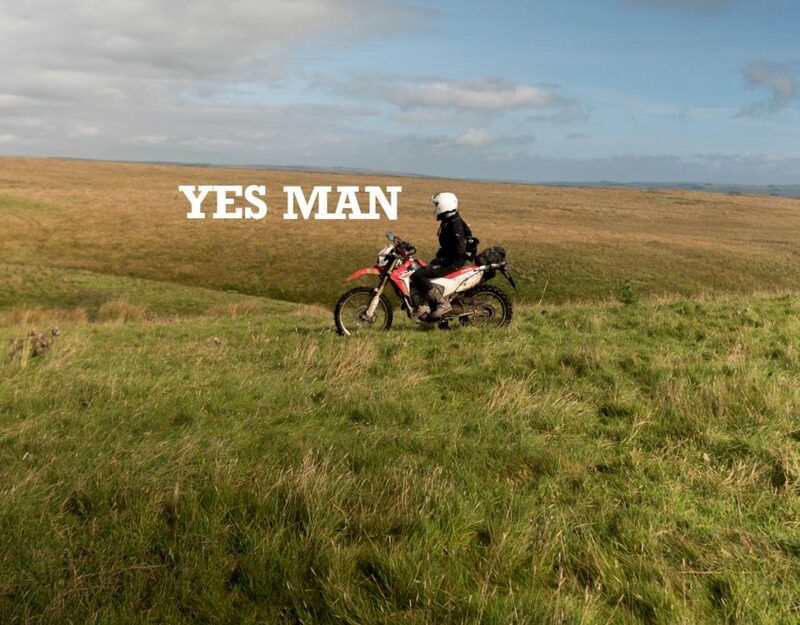 The first weekend in January I drove a 400 mile round trip to southern Cornwall and purchased an eight year old, fully standard, Suzuki DRZ400s with a mere 2,800 miles on the clock. It is worth noting this bike is the S model, “street” version, with the stronger rear sub-frame for heavy luggage carrying. 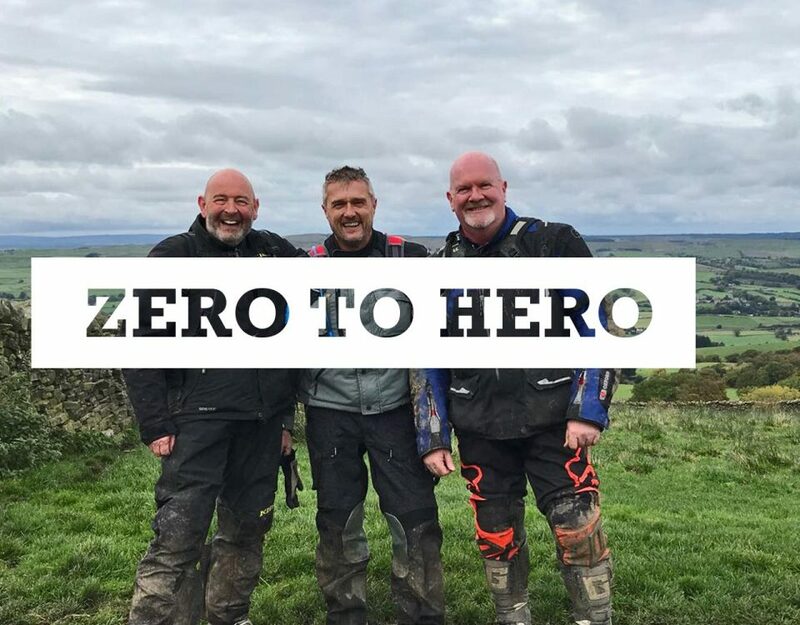 Talking to TRF members, and searching the internet I started to draw up a list of modification I needed to be carry out on my DRZ to make it a real dual-sport motorbike, capable of riding two thousand miles on the road and then riding the dirt trails for a week. Below is a list of my main modification that resulted from two consecutive summers as I rode through France to the play on the Pyrenees dirt trails. 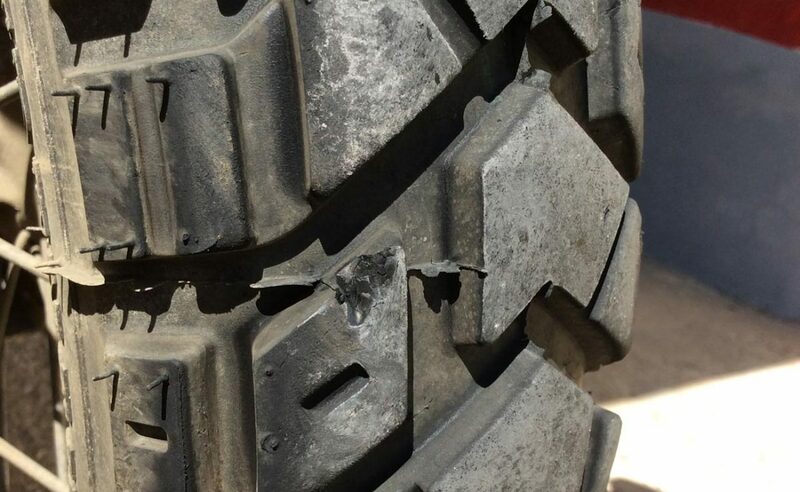 We’ve all seen photos of aggressive knobbly motocross style tires with their open treaded middle blocks ripped from the tire during extended long distance, high speed road work. Furthermore my chosen destination the Pyrenees in summer is a dusty dry environment, where the locals are in constant fear of forest fires. I didn’t need such progressive tyres designed for the clogging slippery mud of autumnal UK trails. 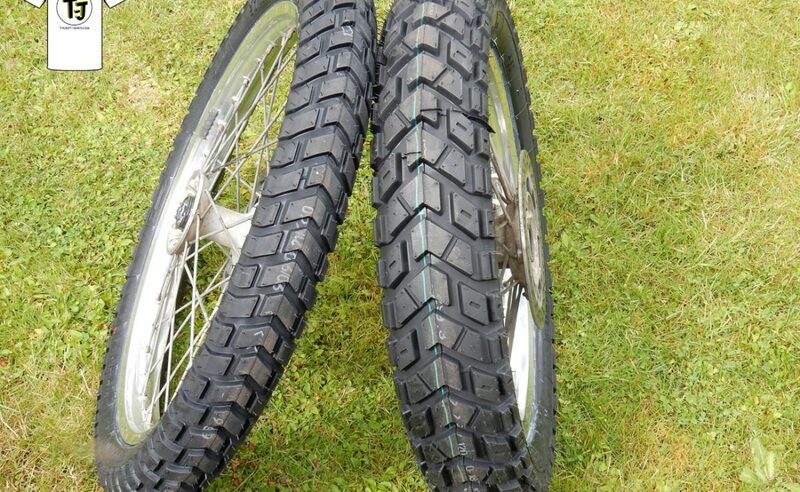 My tyre chose was what is described as a 50% dirt and 50% road tyre with open tread gaps, large enough to get your little finger inside, but with lots of road contact surface area for the ever present threat of a full days riding in the rain when progressing through Northern France. 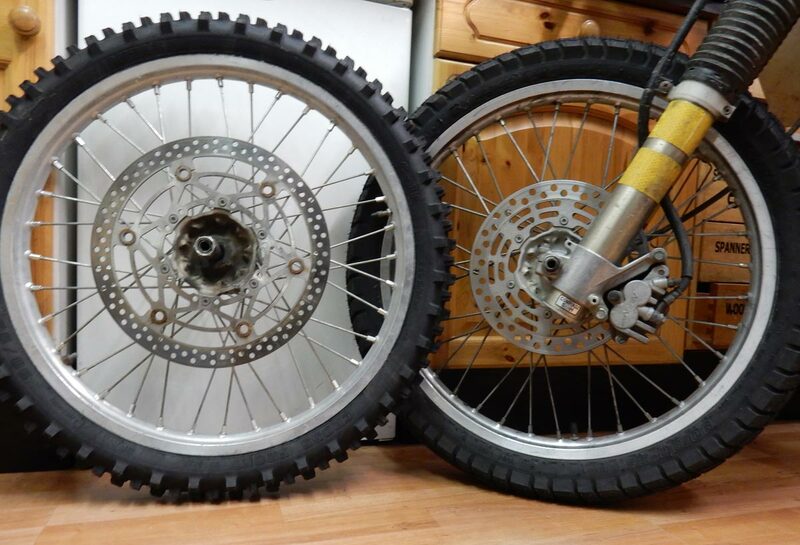 I chose Heidenau K60 Scouts which although having some of the block edges damaged while riding up sharp fixed rock sections, performed perfectly when on the road both in the wet and dry but also on the dust mountain trails. Being a gentleman of increasing age, my midriff girth has also expanded since I first started riding motorbikes; (ok I’m a little overweight!) and I’m carrying full camping kit, tools and spares, as a result I found the standard Suzuki front brake to be lacking when a startled animal or distracted motorist decides to cross my path. An oversized front break disc (replacing the standard 250mm diameter with a 320mm diameter) and calliper extension bracket we installed utilising the existing calliper, master cylinder and hoses. The braking transformation is instantly noticeable and the shorter stopping distance resulted in greater confidence and a less defensive style of riding when riding hairpins and within busy traffic. 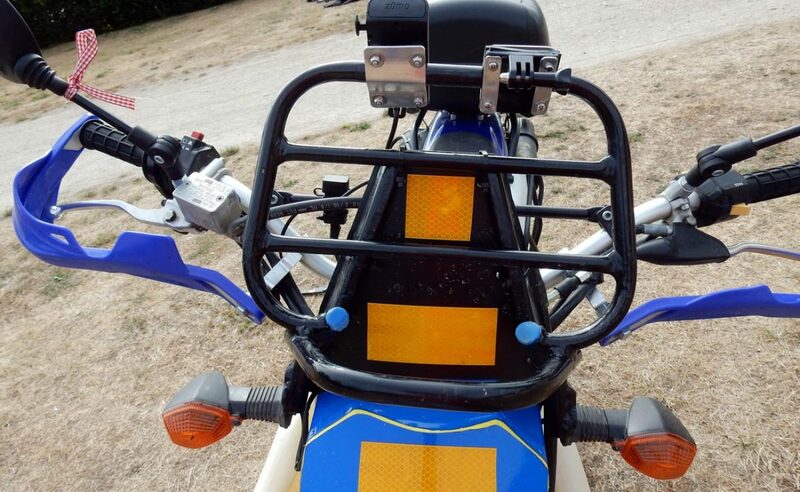 Small dirt styled motorbikes have very short saddles making it both uncomfortable for riding with a pillion for any distance and offering very little saddle based luggage storage when a top box is in use. I’m of an age where an oversized inflatable sleeping mat is an essential camping accessory, gone are my days of sleeping directly on the cold ground with stones sticking in my back all night! My solution to the storage of large bulky but very light sleeping mats is a front rack, ok it’s nothing new, during Mondo Enduro trip in 1995 Austin Vince and his team used similar front racks. The front rack also acts as a mounting point to locate my GPS/SatNav and GoPro, technologies not shared by the original Mondo team. 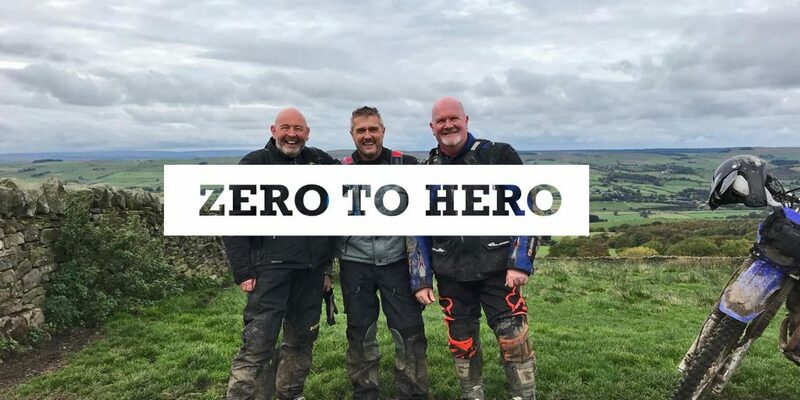 The standard DRZ petrol tank is 10 Litres or 2.2 of our old school Imperial Gallons, when fully loaded, in practical terms, this affords a range of about 100 miles and with the number of petrol station closures escalating throughout Europe this is a cause for concern. I purchased an oversized petrol tank with a capacity of 18 Litres or nearly 4 gallons. 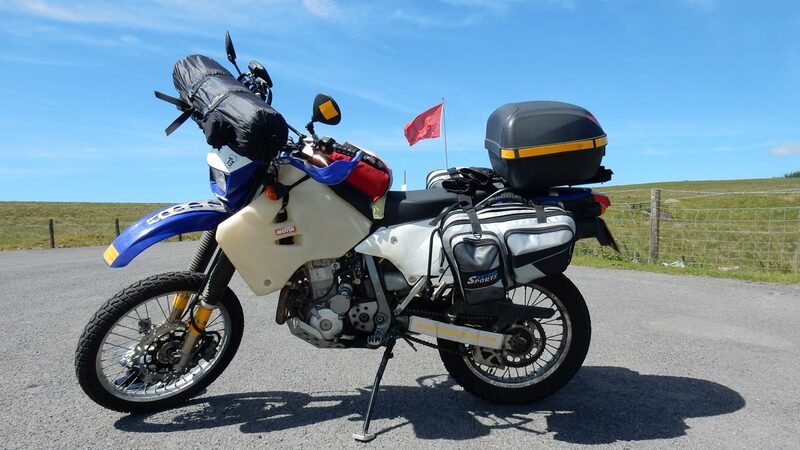 Riding fully loaded, with camping kit, this tank has given a range of 200 miles until the need to use the reserve fuel tap adjustment. Its worth noting my tank is white/natural and as such the level of the fuel can be visibly seen through the tank wall, offering further reassurance on a bike without fuel gauge. When I travel I take a pair of plastic “Croc” style shoes for use within the campsites and restaurants. In addition I wear a pair of lightweight touring motorcycle boots as opposed to heavy motocross boots with rigid soles. 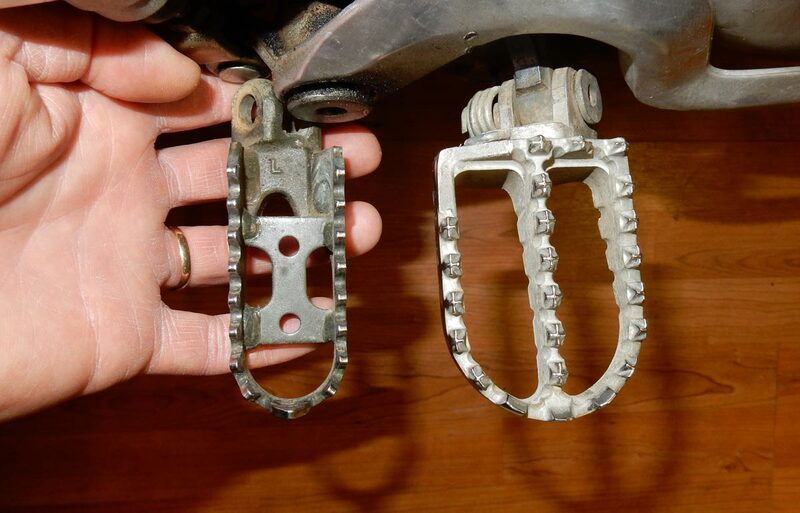 I have therefore installed oversized foot pegs allowing greater comfort on the road but especially when stood up on the dirt trails. As mentioned being of a certain age, I’m a little noise sensitive; my wife calls it “selective hearing!”. 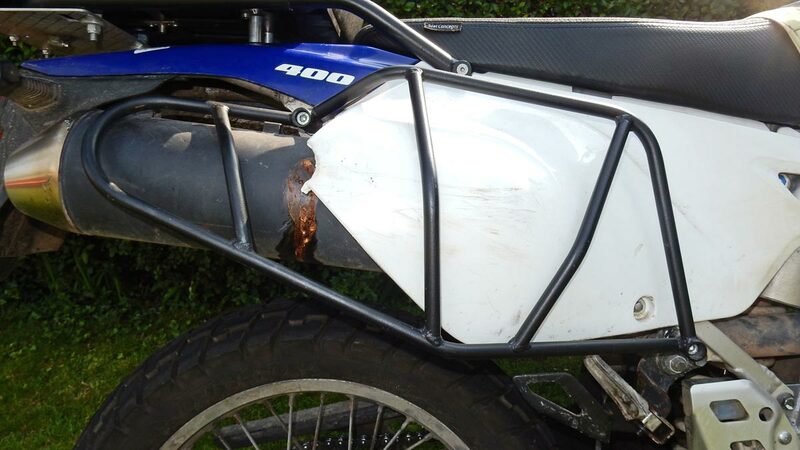 When I purchased my bike it came with an aftermarket sports exhaust, this offered greater flow of the exhaust gas due to wider diameter pipework and minimal baffling within the final box. The flip side of the alleged additional power was an increase in noise. Ok it sounded great, and the throaty burble even prompted a Subaru Impreza at the traffic lights to entice me to a “sound off” blipping our throttles in turn to our mutual gratification. 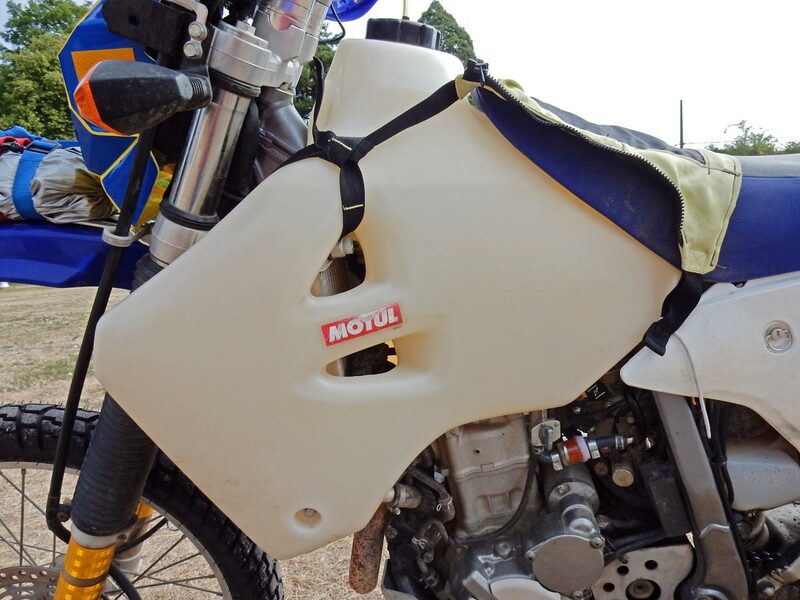 It was however obvious this was not an exhaust note that I could entertain for three and a half continual days riding as I wound my way through the French “B” roads and I quickly found a standard and much quieter replacement Suzuki exhaust. Having an existing set of “throw over” soft luggage panniers, I decided to use these over the current fashion for rigid aluminum luggage. In the back of my mind I’m sure I recalled Chris Scott author of the Adventure Motorcycling Handbook, telling the story of one of his Saharan adventures being cut short when his soft luggage set on fire, destroying his bike. I chose to use a pair of lightweight side racks to ensure my soft panniers were kept safely away from my side panels and exhaust. An over packed pannier still resulted in a melted side panel, but that’s another story. 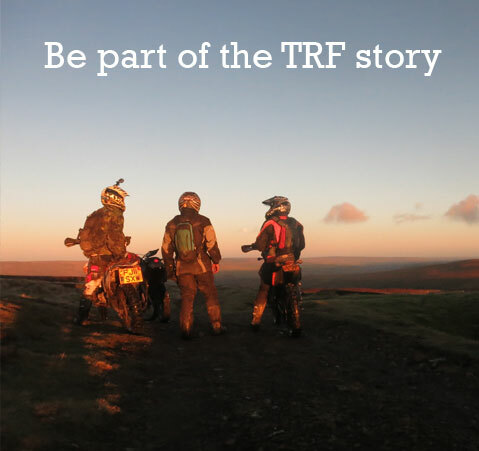 The TRf welcomes bikes of all shapes and sizes, from big GS's to C90's and everything in between. 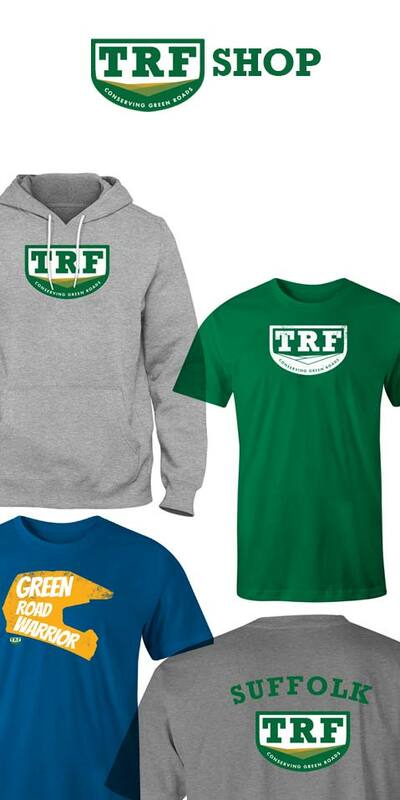 Connect with your local group to discover Green Roads in your area.